​A vital part of any event abroad. Your wedding planner is there to help with all the details and to ensure your event runs smoothly. We partner the venues showcased on MMIF to provide the very best support to you, tailored to your exact requirements. After 11 seasons we are amongst the most experienced in our field, with an exceptional reputation for quality of service. Its both our couples and our suppliers and venues who love what we do. In short, when having a wedding abroad, not having a planning service is like putting the electrics in your new house but forgetting to purchase the sockets. This is particularly true for private hire venues, where there is often no on-site wedding manager/coordinator. Certainly in the South West of France the majority of good suppliers and venues do not take events without a planner. MMIF has spent many years working hard alongside the venue showcased and those key suppliers to provide this vital admin service, to help them develop their venue in line with the current wedding market and to ensure suppliers are easy to work with and professional. Beth Stretton began planning weddings in 2005 when she married in France and realised there was nobody available to help with the arrangements. Having previously organized a large conference for international delegates at Cambridge University, she decided to utilise these skills and set up what has become one of the world’s most respected wedding planning agencies. Beth’s background in the French high end travel industry meant she understood the level of service required by clients, had a good knowledge of French cuisine, wine and local geography. 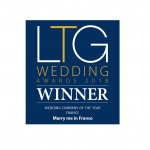 Having had a family holiday home in the Dordogne for many years, this seemed the obvious place to begin and since its conception Get Married in France has developed into one of the première wedding planning agencies in the country, offering a completely tailored service to clients from all over the world. In 2012 Beth took the agency to the next level by launching Marry Me in France (.com), a site combining exceptional event planning skills with a selection of the wedding venues the team partner. Beth manages the UK-end of Marry Me in France, taking regular meetings with couples locally in Wales, Manchester and London and also provides consultancy and styling services. She works alongside independent wedding planners who are all highly trained and pride themselves on a thoroughly personal service. Venue liaison on the ground is headed up by Kate Bouyer, senior affiliate planner. Kate’s background in social work and teaching gives her both a varied professional knowledge base and invaluable transferable skills for the world of wedding planning. Kate provides a very experienced view on the industry and the wedding planner role to clients, venues and other affiliates, all delivered with a wonderful sense of humour – invaluable! The Marry me in France team are exceptionally proud of the events we have planned and coordinated over the last 11 years.